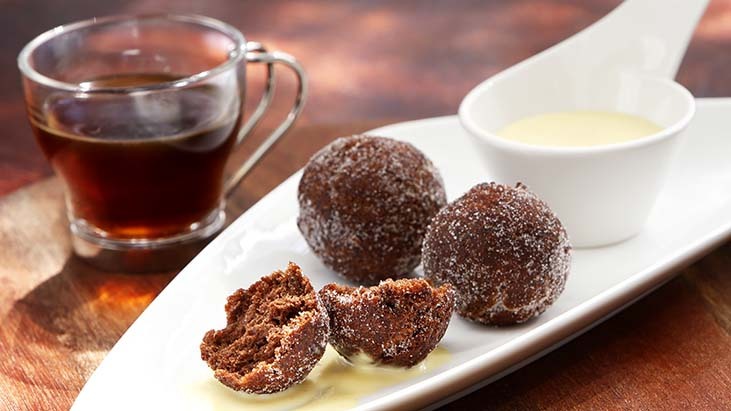 Mini doughnuts served in a sophisticated presentation give an old-fashioned dessert a modern edge. These bite-size treats show the whimsical side of Tasty n Alder, a contemporary steakhouse with a family-style menu. They’re plated to share or enjoy as a single portion. Prepare crème anglaise: Prepare an ice bath. Combine milk and cream in large saucepan; add vanilla bean seeds. Bring to a simmer over medium heat. In large bowl, whip egg yolks and 1 cup sugar until light in color. Slowly whisk cream mixture into yolk mixture. Return mixture to saucepan over medium heat, stirring constantly until thickened. Immediately strain mixture; let cool over ice bath. The anglaise can be refrigerated for up to two days. Prepare doughnuts: Heat 1 tbsp. butter in large saucepan. Scrape in seeds from vanilla bean; stir in potatoes when the mixture is fragrant. Add 1 cup sugar and enough milk to cover. Simmer until tender. Meanwhile, combine the chocolates, cocoa powder and remaining butter in a bowl that will fit over saucepan with potato mixture (the heat of the potatoes will melt the chocolate.) Stir together chocolates and the butter until melted. Remove from heat. Strain potatoes; spread on baking sheet to cool for 10 minutes. Meanwhile, in mixer bowl, whisk together eggs and remaining sugar. Start mixing on medium speed; increase to medium-high and beat until mixture has thickened. In medium bowl, combine all-purpose and pastry flours, baking powder and baking soda. In large bowl, mix chocolate mixture with sour cream, buttermilk and egg-sugar mixture. Pour a few inches of oil into a stockpot and heat to 350 F, or preheat a deep fryer to same temperature. Set a cooling rack over a baking sheet. Measure cinnamon sugar into a wide bowl. Set a food mill over bowl with chocolate mixture. Pass the potatoes through the food mill into the bowl and mix. Stir in the combined dry ingredients, mixing with the spatula until well blended. The dough should have the appearance of aerated chocolate. Pinch off 1-oz. pieces of dough and roll into balls. Work in batches to fry doughnuts about 6 minutes, turning as needed to brown and evenly cook. Transfer to cooling rack; cool 30 seconds then toss in cinnamon sugar. Serve warm with Crème Anglaise on the side.